33.000 sq. ft. of our facilities are dedicated to our Screen Printing. Our facility also has the capability of utilizing PVC Free Printing. 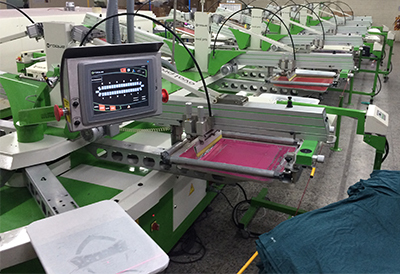 Screen printing is also a stencil method of print making in which a design is imposed on a screen of polyester or other fine mesh, with blank areas coated with an impermeable substance. Ink is forced into the mesh openings by the fill blade or squeegee and onto the printing surface during the squeegee stroke. It is also known as silkscreen, serigraphy, and serigraph printing. One color is printed at a time, so several screens can be used to produce a multicolored image or design.